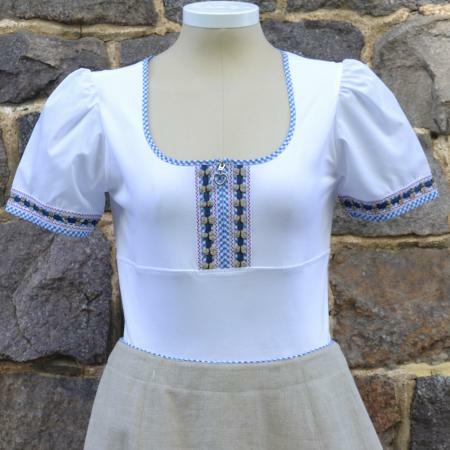 Ladies German blouse in white with blue gingham trim. Ladies German mieder vest in tan with blue gingham and red trim. Ladies German skirt in natural linen. This beautiful dirndl comes complete with the apron and the blouse included. Off the shoulder shoulder blouse featuring buttons going down the front, and puffed sleeves with a tie up option. Embroidered edelweiss embroidered button down blouse. Simple white shirt with intricate lace detailing and puffed sleeves. A short white blouse, featuring lace around the trim. Beautiful short white blouse, with a ruffled collar and puffed up sleeves. White blouse with embroidery. Lace around the neck. Button down.